Political manoeuvring and Media sell-out. 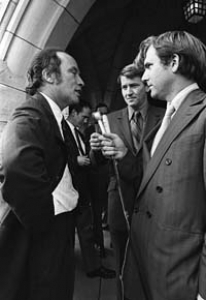 On October 13th 1970 Prime Minister Pierre Elliot Trudeau was intercepted by reporters in Ottawa in one of the Country’s most famous media confrontations. Bombarded with questions about his decision to put soldiers on the streets of Ottawa Trudeau stopped and engaged CBC reporter Tim Ralfe. Two things transpired during this exchange. First, Ralfe did not accept the Prime Minister’s answers in regard to tightened military security. Second, the Prime Minister stood his ground and carried on with the reporter for a solid six minutes. Here is a sampling of that exchange. Ralfe: But with your army troops you seem to be combating them almost as though it is a war. And if it is a war is anything they say have validity. Trudeau: Don’t be silly. Were not combating them as if it is a war, but were using some of the army as peace agents in order that the police will be more free to do their job as policemen and not spend their time guarding your friends against some form of kidnapping. Thirty years later media and politics have changed significantly. Media is often guilty of creating controversy where it does not exist using political correctness and innuendo to spin stories, while politicians have become the craftsmen of spin. Rarely will politicians enter into interviews without a preset condition of timings and questions. They now operate with handlers who will shut out members of the media who put them on the spot. Therefore when a member of the Government or Opposition sits down with a reporter and is asked about a sensitive subject they will usually not answer that question, and if the reporter persists? Well let us just say that it is accepted within the ranks of the media that they will not be getting an interview with that politician again. This tactic runs across all party lines and is readily accepted by all media outlets. Another tactic used by politicians to evade tough interviews is doing their press release at key times that will result in a time lapse. The Ontario Provincial government used this tactic during controversial press releases. The Caledonia Lawsuit settlement was released to the press before a long weekend so that reporters would have to wait three days and the story would lose oxygen. Conservative MP Julian Fantino has been recently criticized for doing this during his election campaign by not returning reporters calls and failing to show up to debates. Former Prime Minister Jean Chretien went so far as to push reporters out of his way when Ad-scam became a hot story. Welcome to the new age of political spin-doctoring and media without backbone. If you have watched an interview where a politician should be getting grilled, but the reporter is lobbing softballs you now know why. The politicians are the masters of deception, and the media has become so punch drunk that it is willing to compromise its integrity to be on the “A” list. Don’t yell at the television or radio, because you’ve been sold out.